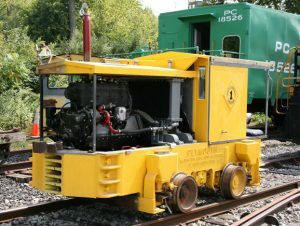 The Rochester & Genesee Valley Railroad Museum is fortunate to be able to roster a very unique Plymouth Model BL gas-mechanical locomotive. This locomotive was donated to our Museum in 1999. It had been located at the former Odenbach Shipyard (also known as Air Force Plant No. 51) since 1942. We have been unable to locate any proof of the Plymouth serial number for this unit. We are certain that it is a model “BL”, because virtually every casting has this designation. Plymouth constructed approximately 400 BL locomotives from 1915 through 1927. Through research of the production phases of the BL, we have narrowed the search to approximately forty model BLs, due to its standard gauge wheels and axles, and its type 2 frame. One of these forty was built for the Despatch Car Shops, a subsidiary of the New York Central, in East Rochester, N.Y. This is the Plymouth Serial number 969, built in September 1920. In April 2008, we were contacted by an individual with records to show that indeed BL #969 was sold to the Despatch Car Shops in 9/1920 and resold to the Odenbach shipyard proving that we indeed roster the #969 as we know there was only one BL at Odenbach. In 2016 were were contacted by another individual who recalled the Plymouth arriving at Odenbach in June or July 1942, when the shipyard was constructed off Dewey Ave. in nearby Greece, N.Y., to fill government contracts for the military during the second World War. During this time the locomotive was converted from gasoline to propane fuel, to avoid wartime rationing restrictions. It remained in use even after the site changed hands through the 1950s. It was abandoned in place until recovered by museum volunteers. 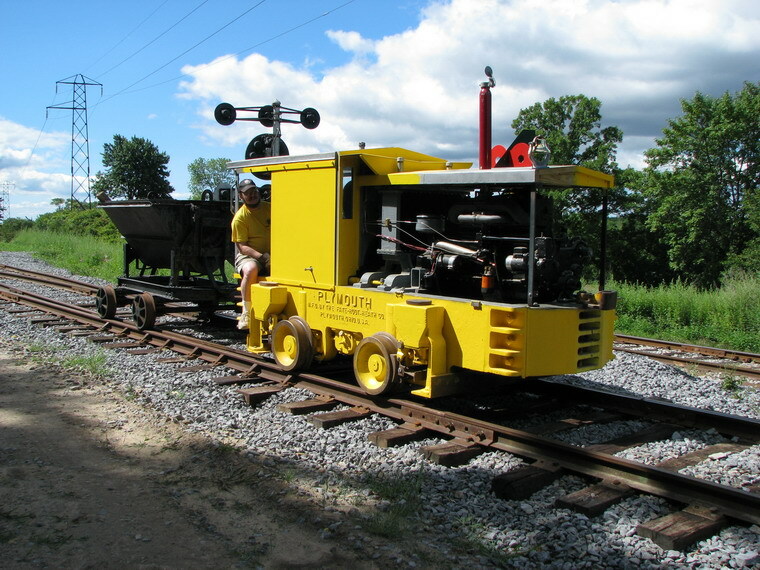 Museum member Jerry Liederthiel made volunteers aware the small locomotive was still in existence, and arranged for its donation. In the intervening years, the locomotive had sunk into the asphalt up to its frame. Several museum members assisted in jacking up and relocating the Plymouth to Industry in 1999. Stabilization work took place in 2000, and it was moved into the Restoration Shop in 2001. Volunteer project manager Kevin Klees performed and coordinated most of the extensive mechanical restoration work, and the Plymouth BL made its operational debut in 2007. This unit is one of the oldest Plymouths, and one of the oldest internal combustion locomotives of any kind in existence. It is now fully operational, currently stored serviceable. This locomotive is currently not on public display. Model: BL (The earliest Plymouths were model AL, followed by BL, CL, and so on. As the product line expanded, a more complex model designation was created). Weight: 6 or 7 tons (documents vary). It was apparently advertised as a 6 ton locomotive, but they generally weighed in at about 7 tons. It was determined to be better marketing practice to underestimate the advertised weight, rather than overestimate. Engine: Buda FRH four-cylinder, approximately 50 hp gasoline engine. Converted to propane fuel after 1942. Transmission: Friction wheel, with chain drive to both axles. Buda Engine from Plymouth BL Rolls OverFebruary 1st marked the 1st time in many years the Buda engine from the R&GV Railroad Museum’s Plymouth BL gas-mechanical locomotive has rolled over under its own power! Brought to the museum in derelict condition, the engine has been completely rebuilt so this was beautiful music to the members of the R&GV Railroad Museum.